If you happen to be in the market for a new case for your iPhone 4 or iPhone 4S, we have a couple of unusual iPhone cases for your consideration today in the form of the FreshFiber Boombox case in grey, and the iFoolish Magic Drawing case in red. So let’s kick off with that FreshFiber Boombox case for the iOS smartphone, as the title suggests, the case is designed in the shape of a retro boombox, and delivers protection from scratches and damage to the back, sides, and corners your iPhone 4 or iPhone 4S. The FreshFiber Boombox case delivers access to the touch screen at all times along with all the usual cut outs, and also features a flip out stand that is actually the boom box handle. Available in grey only you can purchase the FreshFiber Boombox case for the iPhone at a cost of Â£24.95 from Mobile Fun. 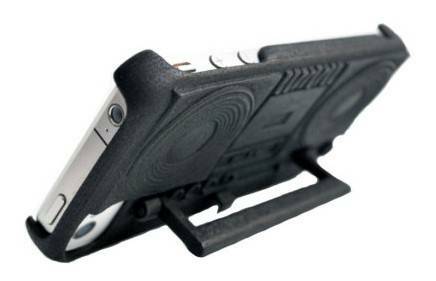 On to the iFoolish Magic Drawing case, again for the iPhone 4 and iPhone 4S, which is manufactured in tough polycarbonate, and delivers robust protection to the back. Sides and corners against everyday damage, whilst adding old school nostalgia and interaction by way of enabling the user to draw n the case. The iFoolish Magic Drawing case features a surface on its rear that can be scribbled upon by using the accompanying magic pen and is a great case for the kids as well as for adults to jot down notes when on the go, and can be used over and over without draining your battery power. The iFoolish Magic Drawing case is a hard shell case and is available in red for the iPhone 4 and iPhone 4S at a cost of Â£19.95 by hitting up Mobile Fun.